The origins of the church in Meldreth can be traced back to a pre-Conquest monasterium with five priests, recorded in 1086 as belonging to the monastery at Ely. From the early 12th century the church was appropriated to the Priory, and after the Reformation, to the Dean and Chapter at Ely. The church was built largely of rubble, which would have been rendered with a lime plaster. The present ‘Roman cement’ on the south side dates from the early 19th century. The use of good building stone, which was expensive to import, was confined to architectural features. In the 17th century the church became dilapidated and underwent several restorations during the 18th and 19th centuries, with a major restoration between 1896 and 1898. Further restoration work and re-ordering took place during the 20th century, the most recent addition being the building of the meeting room on the north side of the church. The dedication to the Holy Trinity is first recorded in 1443, but it could be much earlier as that dedication had achieved some popularity after the martyrdom of Thomas Becket who had instituted the Feast of the Trinity on the Sunday after Whitsunday, the day of his consecration in 1162. The present church was begun, and its overall dimensions established, in the second half of the 12th century, working westwards from the chancel to the tower. It was not until the 15th century that the church was enlarged to its present state with the addition of a spacious south aisle and south porch. 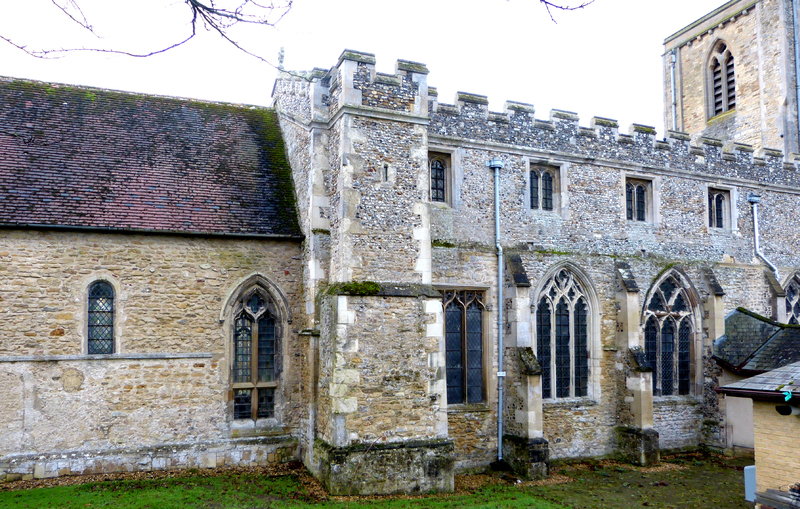 Surviving from the second half of the 12th century are the rough rubble walls of the chancel, together with the three small, round-headed windows, but the three eastern lancets, though 12th-century in style, date from 1871. The north wall of the nave also survives from this early church, together with the north door and the lower stage of the tower. This church was completed in the later 13th century with the construction of the upper stage of the tower. View from the north, showing the blocked door of the former vestry, the 14th-century windows, the staircase added to provide access to the top of the rood screen and the late 15th-century heightening of the nave wall to provide a clerestory. The new meeting room is visible on the right. In the first half of the 14th century, three impressive windows were inserted into the north wall of the nave, probably by masons from Ely as the tracery patterns are based on windows at Ely Cathedral. The stained glass in these windows was almost totally destroyed on March 14th 1643 when the Puritan William Dowsing and his men visited Meldreth and destroyed ‘62 pictures in the church, a cross on the steple and 2 pictures of Christ’. The fragments of the medieval glass that escaped this destruction have been reset in the tracery lights of these windows and in the north-western window of the chancel. Fortunately, John Layer had recorded the heraldry in the in the 1630s and this suggests that each window had been commissioned by an individual family. View into the chancel looking north-east, showing the door to the former vestry, which was demolished in the late 17th century. Also in the 14th century, a vestry was added to the north side of the chancel. Its construction blocked windows and necessitated the insertion of a new transomed window at the west end of the north wall. The piscina and aumbries also date from this refurbishment and it may have been at this time, though perhaps later, that the chancel was decorated with wall paintings, now in a very fragmentary condition. A further addition was a splendid traceried east window (visible in the 1743 drawing, but destroyed in 1871 to the subsequent regret of the Vicar), beneath which was an inscription: ‘Orate pro anima fratris Alexandri de Bury qui istam fenestram fecit’ [Pray for the soul of brother Alexander of Bury who commissioned this window]’. Alexander may have been the Guest Master at Ely in the late 1370s. 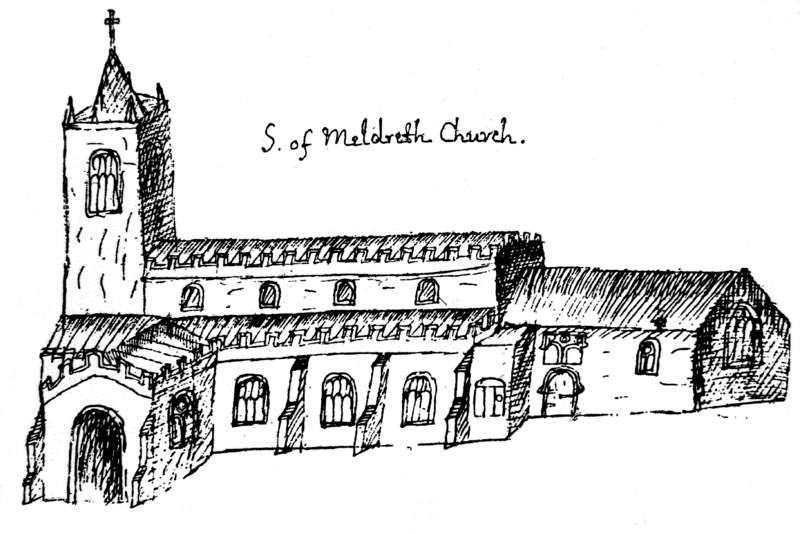 At the Reformation, medieval altars were destroyed because they contained relics as a requirement of consecration, but it was noted as late as 1561 that this destruction had not yet happened at Meldreth. The present altar is made up of a sturdy 17th-century altar table, which was brought from St Botolph’s, Cambridge in 1872, with an extended mensa given by George Jebb in 1939. A small table, which may have been the Elizabethan altar, was stolen from the church some years ago. That altar was probably placed in front of the screen and may have occasioned the insertion of an additional window at the north-east end of the nave. A major remodelling of the church took place in the late 15th century with the addition of an ambitious south aisle, lit by broad, three-light windows with rectilinear tracery typical of the Perpendicular period. This necessitated the construction of the south nave arcade, the rebuilding of the chancel arch, and the raising of the height of the walls of the nave (evidence for this is clearly visible on the exterior of the north side) to create a clerestory, which was surmounted by a fine timber roof supported on angel corbels. The entrance to the church was now through a grand south porch, which would have served a variety of functions, including the first stages of the wedding ceremony, the ‘churching’ of women after childbirth, and the transaction of legal business. The door is original, with minor later repairs, and has lateral holes for an internal draw bar. 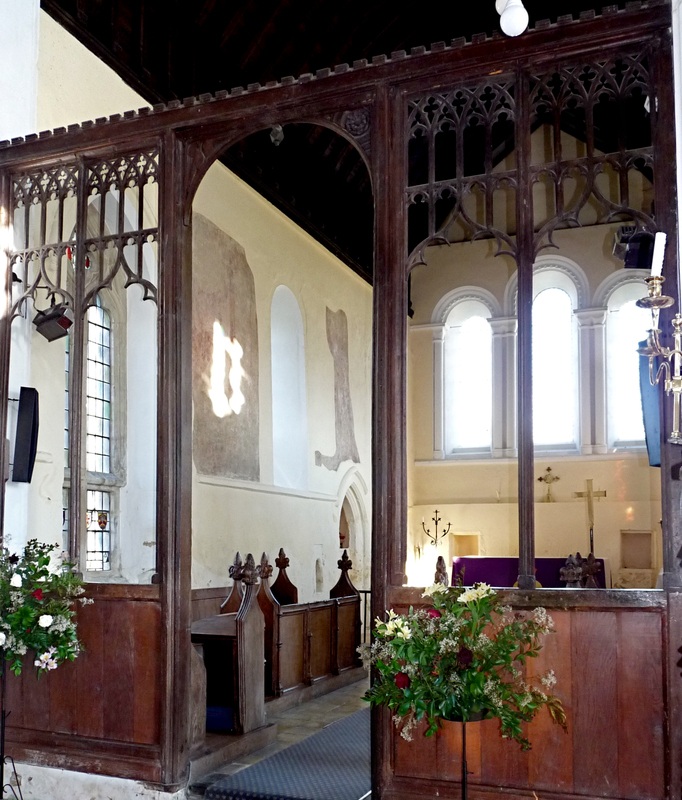 This refurbishment of the church probably included the insertion of an elaborate wooden chancel screen, elements of which survive in the present screen. Originally the screen was much more substantial with a gallery across the top, access to which was provided by the internal doors that are still visible and a staircase that had to be added to the north side of the church. The screen was surmounted by a large image of the crucified Christ, to which Richard Harvey made a bequest of £3 in 1503. 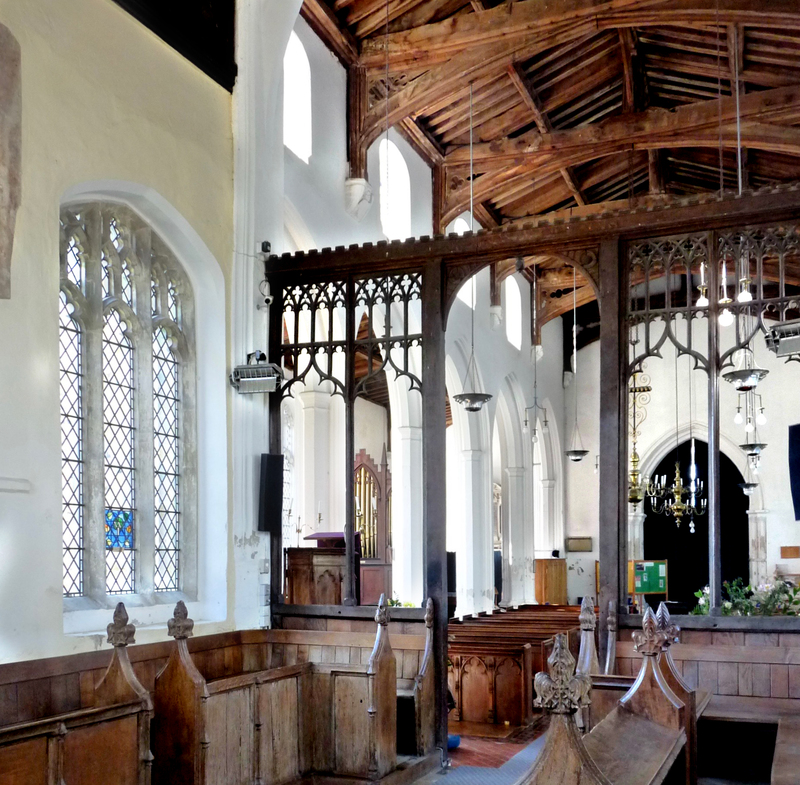 The present nave pews were brought here from Papworth St Agnes in 1977 to replace those installed in 1842, which, in turn, may have replaced some 18th-century pews. Prior to c.1840 there seems to have been a west gallery beneath the tower arch for the choir and instrumentalists. Remarkably, an early 19th-century Choir book for Meldreth survives. The organ is of considerable interest as it was built by Joseph Walker as a barrel organ (two of the original three barrels survive), perhaps before 1838, and was later, in 1856, provided with a keyboard. 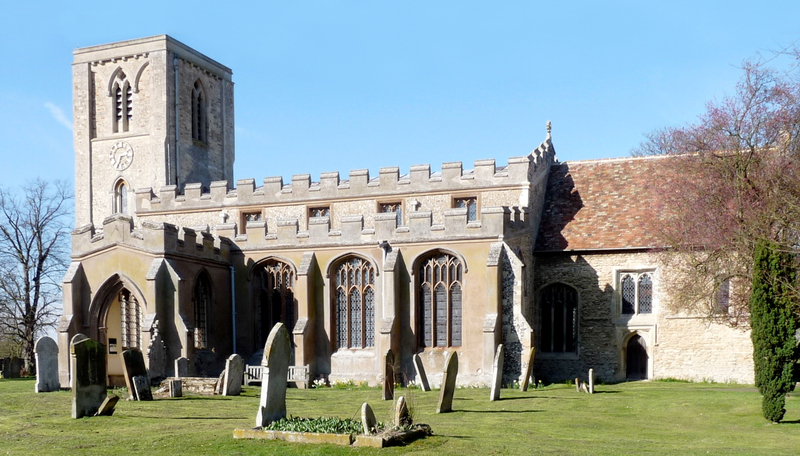 It was purchased from Bassingbourn church and moved to Meldreth in 1865. Originally placed below the tower arch, it was moved to its present position in 1895. Though repaired several times, the pulpit probably dates from the 17th century. Formerly, it stood on the north side of the nave and when it was moved to its present position in 1948, the architect, Stephen Dykes Bower, designed a canopy and sounding board to serve as a war memorial, but the scheme proved too expensive. The font is likely to be 15th century, moved to its present site in a recent re-ordering from a central position at the west end of the nave, opposite the door. This was its traditional position, directly related to the entrance to the church, thus marking the significance of the Dominical Sacrament of Baptism as the symbolic entry into the Christian Church. Meldreth church has a few ledger slabs and two worn brass indents, but only three wall memorials. The finest, now on the west wall of the south aisle, is the monument to George Pyke, dated 1658, which was originally in the Pyke chapel which he built onto the east end of the south aisle (visible in the 1743 drawing). It became dilapidated and was demolished in 1887. Other items of interest are the two brass chandeliers. One of these was originally given by William Bacon, vintner, to St Benet’s Church, Cambridge in 1725 and was acquired for Meldreth church c.1870. 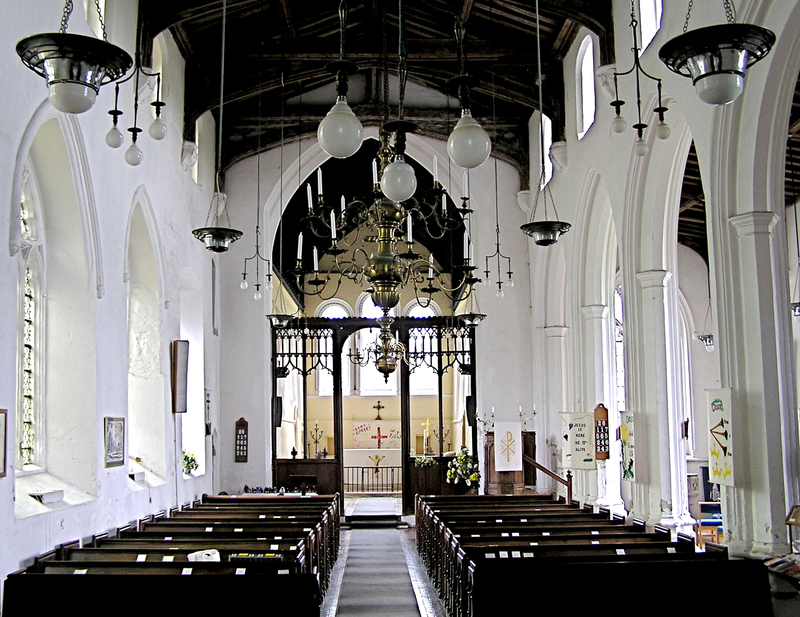 It is not known when the other chandelier, which dates from the 1770s, came to the church. The hanging light fittings are also worth noting as a curiosity. They are the old candelabra from the pews hung upside down. The pine chest probably dates from the early 15th century and originally would have been used for the secure storage of vestments and plate, and, later, for parish records. Two thatching hooks on the south wall of the tower are an unusual survival. An entry in the Constable’s account for 1723 records the purchase of two fire-hooks from Thomas Barber, Smith. The church provided a central location in which to keep these large hooks on long poles used for ripping off thatch when cottages caught fire. The impressive ladder leading up to the ringing chamber was made by Benjamin Hale and is dated 1863. The tower clock by Gillett and Bland was installed in 1880. The church has one large stained glass window from the 19th-century. This is in the south-eastern window of the south aisle. It was given by John Mortlock in 1885 and is probably from the workshop of Clayton and Bell. Meldreth church is well known for its peal of bells, largely due to the efforts of John Gipson, who gave the final two bells in 1968. The oldest bell is dated 1617 and bears an inscription: ‘Non sono animabus mortuorum sed auribus vivencium’ [‘I sound not for the souls of the dead but for the ears of the living’].